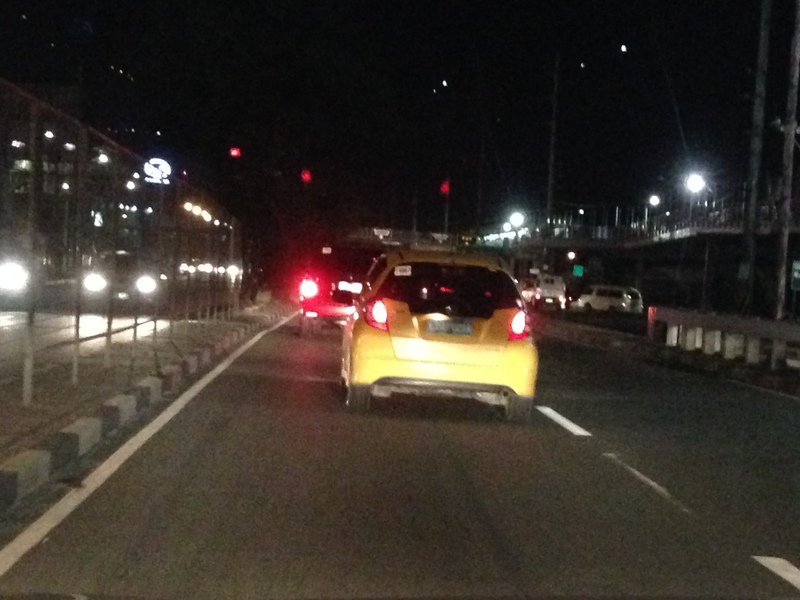 Last night as we were on our way home, we noticed a vehicle in front of us swerving left and right as if the driver . We were in heavy traffic and vehicles from the adjacent lane were already falling back in order to avoid this vehicle. Even with the tint on the vehicle’s rear window, we could see the driver frequently leaning over the passenger side. At first, we would have dismissed this as the driver likely just taking care of the passenger (i.e., a parent perhaps checking on his/her child). However, closer inspection revealed what appeared to be a male driver leaning over to kiss what was likely a girl in the passenger seat. This went on for quite some time as we crossed the bridge along Marcos Highway and at full stop, we could see how busy the guy seemed to be with his display of affection. And so to get the driver back to focusing on his driving, we decided to give them a rap of the horn and flashed the high beam to their attention. The car swerved quickly to the right and sped off in what seemed to be a manoeuvre of embarrassment (We do hope he was embarrassed enough to focus on the road and driving, and not on “enjoying” his passenger. The road is not the place for such actions as they endanger other road users. Yellow Honda Jazz with plate number NUT 801 was zigzagging along the road and there was no one to apprehend such drivers despite cameras supposedly installed along this road to monitor traffic. This is a reminder to us that what’s wrong with a vehicle might be the one sitting behind the steering wheel – it’s driver. Drivers and other road users should always think about other people around them. Their behaviour and interactions along the road will determine how safe our roads would be for all users. This is practically the same principles regarding drunk driving or sleepy drivers whose behaviours under the influence or due to drowsiness could result in fatal crashes. These crashes and the resulting injuries and/or loss of lives are preventable with proper driving, riding and even pedestrian behaviour and is something each road user also has a responsibility to promote, even if it means simply getting the attention of another driver for him to drive more responsibly. By d0ctrine in Behavior, Road Safety on June 24, 2014 .